I wasn't too crazy about any of the books for this past week so when it came time to decide which would be my Pick of the Week, I chose Thor. It's been a very well written book. This issue played with some interesting themes, made more interesting by the characters, that in particular being a dragon. This issue is a stand-alone story, which I love seeing now and again between big arcs, but it also introduces new characters and settings for Thor to get to work in. There's Midgard. You know, Earth. It was like Thor forgot about Earth for a while. There are she-vikings and dragons, too. 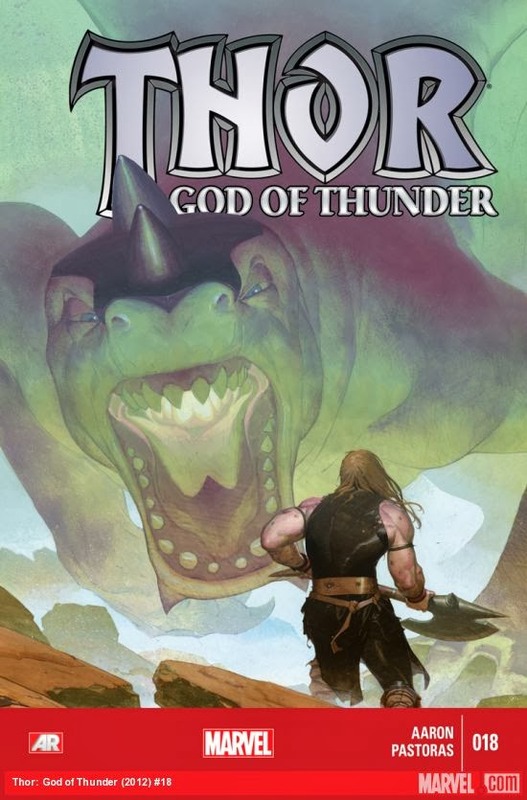 Thor starts the story out inside of a dragon's mouth. It felt a bit like Pinocchio inside of the whale but the one pretending to be a real boy in this case was the dragon, who only wanted to party hard. Party hard! The dragon was getting the blame for eating the dogs and all around ruining things for the she-vikings. So, they prayed to Thor to help them out. Thor finds that it wasn't the dragon eating their dogs but some other bad guys that he and the dragon set about to killing. They find some foul smelling liquors and on a dare they start to get completely wasted. So to the dragon, he and Thor are now good buddies. Thor thought the relationship was totally casual, especially seeing as how very drunk he was when hanging out with him. The dragon has a fight with his own father. He doesn't want to be like him and he thinks his father needs to become a bit more progressive with his attitude towards humans. It's a little absurd when you think about it all. The dragon can speak and think and feel. It's not a raging monster that only wants to wreak havoc. It has a soul... up to when it decides that it would indeed rather eat all the humans instead of party with them. We also see more of Thor's issues with authority figures as he butts heads a bit with Heimdell and chooses to completely ignore a request to see Odin. I liked the art in this issue. It's got a rough hand to it that makes it work very well for a story about dragons and vikings. The first few pages are so fantastic. The view from inside the dragon and then Thor with dragon spit all over him was disgusting but cool. I liked the details. There is one panel that sticks out in my mind, and that's the one where Thor has collapsed onto his bed in Asgard. I loved the way Thor is sprawled out with the room disheveled and his axe stuck into the wall above his bed. It recalls to me some of that loneliness Thor showed when he was getting drunk with his fellowship (or more so drunk alone and talking to his axe) from the dark elves story-line. It was not bad all around, and I really love the cover.